Walking with Jesus: Day 146: Luke 22:24-53 & Psalm 142 - Where Do You Find Your Strength and Confidence? Day 146: Luke 22:24-53 & Psalm 142 - Where Do You Find Your Strength and Confidence? Where Do You Find Your Strength and Confidence? As the time drew near for Jesus to be betrayed by Judas into the hands of His enemies, He took time to pull Peter aside and warn him of Satan's desires for him. Peter, in his characteristic bravado, responded, "Lord, I am ready to go with you both to prison and to death." Before we judge Peter too quickly or too harshly, we need to understand that he was serious. He meant what he said. Hours later, he would draw his sword and cut of the ear of the servant of the high priest. Peter was a man of resolve, a man of action. While he would later deny knowing Jesus three times, he was sincere here in his desire to fight for his Lord. Jesus didn't want Peter's sword. He wanted his prayers. Rather, He wanted Peter to find his confidence not in his sword but in his prayers and in Jesus' prayers for him. Jesus told His disciples, “Pray that you may not enter into temptation.” While Peter was willing to draw his sword and strike, he was unable to stay awake and pray. How many of us find it easier to do almost anything rather than to pray? 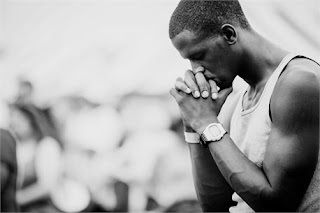 How many of us could spend hours laboring for the Lord but find it hard ti spend a single hour on our knees before Him? Do we think our resolve, our hard work, our expertise and our diligence are all worth more to the Lord, and to us, than prayer? Jesus told His disciples to pray. This was their best weapon against temptation. Jesus told Peter that He was praying for him. This was Peter's best source of comfort in a time of great trial. Our prayers and Jesus' prayers for us should be where we find all of our strength and confidence in times of trial and temptation. When we are feeling stretched and pushed, we need to resist the temptation to swing out swords and instead drop to our knees! with my voice I plead for mercy to You, my Lord. I will tell my trouble before You.